A mother in the My Sleeping Baby Facebook Community recently asked: When can babies fall asleep on their own? Can I sleep train newborns? Is there a specific age where a baby no longer needs to be rocked to sleep? My son is only 2 months, so I’m not expecting this now. Is this part of sleep training at 4 months, or am I simply creating bad habits? Here’s the deal, in a nutshell: Don’t worry about creating bad habits just yet! At 2 months of age, your baby is in the thick of the “4th trimester”. This refers to the first 3 months of the baby’s life when he transitions to life outside of the womb. It’s very normal during this phase for a baby to be VERY needy. I mean, remember- your baby was living in the womb for 9 months. This big world is new to him! This is why you want to mimic the womb as much as possible during these first few months. It’s inherently calming and soothing to your baby. So if your baby needs help falling asleep at this stage, it’s FINE! HOWEVER….don’t underestimate what your newborn can do! While we’re not doing any kind of behavioural sleep training at this age, many newborn babies can actually fall asleep on their own (or somewhat on their own) with the right conditions in place. Look- it’s never a problem to help your newborn baby fall asleep if they need the help. But, I always encourage parents to try putting their baby down awake (or drowsy but awake) once a day and see what he can do! See, the more practice your newborn can get at falling asleep independently, the better he’ll get at falling asleep without assistance, which means there’s a much higher chance you’ll avoid potential sleep problems down the road. Now, this isn’t always possible with every single baby. If you have a very fussy, high-needs colicky baby who is still struggling to adjust to life outside of the womb, then don’t make yourself crazy trying to get your newborn to sleep awake. If it’s not going to happen without him screaming bloody murder, don’t worry about it. What if your newborn baby CANNOT fall asleep independently? 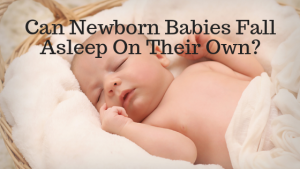 Can we sleep train newborns? Continue to help your little baby to fall asleep for now, it’s no problem. We’re not about to sleep train newborns. It simply means that when your baby reaches that 4-6 month mark, you’ll be able to do some behavioural sleep training and teach him how to fall asleep on his own. So if you’re struggling with getting your baby to fall asleep at bedtime, and if you’re still getting woken up all night long, sleep training can help! Are you creating bad habits by rocking your 2 month-old baby to sleep? No. Your little one is still in that 4th trimester and might need some help falling asleep. That being said, I strongly encourage you to TRY, even once a day, to put your baby into his bassinet awake. He may surprise you! Need sleep? 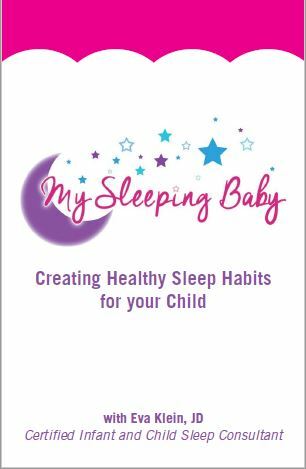 Download the My Sleeping Baby eBook NOW!